With Cristin Milioti (The Mother) recently claiming that all of our morbid ideas regarding her character dying in the series finale were totally way off, we were able to focus on a happier episode. The premise was gloomy: Marshall is determined to figure out where Lily went during their fight a few episodes ago. However, in reality, it was a sweet—if not predictable—viewing. It turns out that Lily went to visit her boss, the Captain, who has a house near Farhampton. 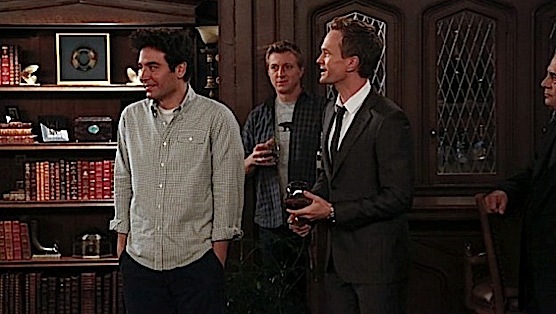 Marshall, Ted, Barney, Ranjit and William Zabka rush over to the Captain’s house where Marshall is prepared to fight. He references his pretend sword fights with Ted and challenges the Captain to a duel, but it turns out the Captain is a three-time Olympic gold medal winner in fencing. Luckily, Ted realizes there is more than meets the eye and puts the Moesby Boys (his mystery-solving team he had when he was a kid) on the case. Everything hinges on the fact that Lily never chews gum, but recalls her chewing gum recently that was very similar to the Captain’s new wife. He tracks her whereabouts from the wee hours in the morning thanks to William Zabka seeing her getting into a car with the license plate that read “AHOY!” and he deduces that she has been smoking again. Lily always smokes when her and Marshall are away, and he assumes that she snuck off again, stopping at a convenience store to pick up a pack on the way to use the Captain’s bathroom as a safe haven for smoking. In the bathroom was a daisy planted in a pot. Ted digs around, looking for a cigarette, but finds a pregnancy test. Of course, that is the plot. How could it not be? She had been sick recently and was trying to keep a secret. There are a series of flashbacks that show all of the misdirects so far in the season actually leading to this revelation. The biggest was that whenever she had an empty drink in her hand a bartender would bring her a new one. It turns out they were waters and not vodkas. Because of this, we flash-forward to Italy a year from now. Marshall and Lily move there because he wants her to follow her dreams because she gave him his, twice. First Marvin. And now a baby girl named, you guessed it, Daisy. It was predictable, but adorable. I’m glad to see Marshall getting the big family he has always wanted. The other half of the episode deals with Robin’s mother (Tracey Ullman) describing all of the warning signs that her ex-husband was going to turn out to be a bad husband. All of them are eerily similar to Barney’s actions, resulting in Robin freaking out. All of Robin’s worries are squashed when Barney finally meets Robin’s mom and they hug. She proclaims he is nothing like her father. It was a throwaway plot, but did well as a side story to the more emotional one with Marshall and Lily. This episode was definitely a way to wrap up one of the reoccurring subplots surrounding the Eriksons and leaves less to cover in the remaining episodes. It was Mother-less, which usually means disaster in season nine, but fortunately, this episode wasn’t a train wreck. Average and sweet. Definitely a solid effort in the waning hours of a near decade-long show. Adam Vitcavage is a Phoenix-based television critic who contributes regularly to Paste. When he’s not watching and talking about television, he teaches literature at a high school. You can follow him on Twitter.